This is by far one of the more satisfying biographical treatments of Mark Twain available on Audible. 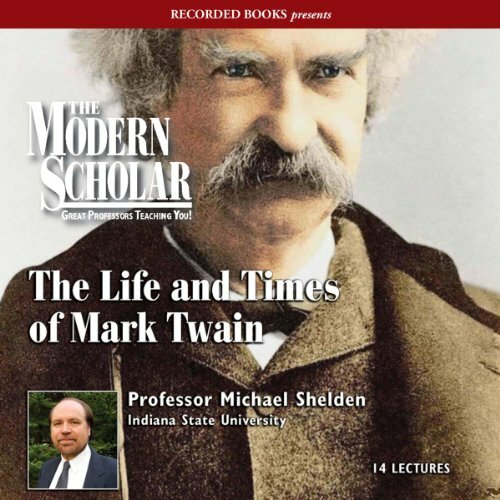 Michael Shelden relates the high points of Twain’s life and career, and along the way provides passionate and sometimes moving analyses of his major works. Unfortunately his delivery is flat, so much so that it took me a long time to get around to listening to it all the way through. What I found is that his voice grew on me, and I was able to focus on the content and stop thinking about the unemotional (and sometimes repetitive) way it was presented. Shelden knows what he’s talking about. He wrote one of the best books available about the later years of Mark Twain, Man in White, also available on Audible (and fortunately with a better narrator who is able to do justice to the book). Despite Shelden’s weakness as a speaker, this is definitely worth a listen. These 14 half-hour talks are presented in quiet way that lets the words and ideas speak for themselves. Highly recommended to those who want to know more about this important American author. What made the experience of listening to The Modern Scholar: The Life and Times of Mark Twain the most enjoyable? Felt like the author knew him and is just telling about a friend. The author/performer is pretty soft spoken, but it was alright. Just made me pay that much more attention.